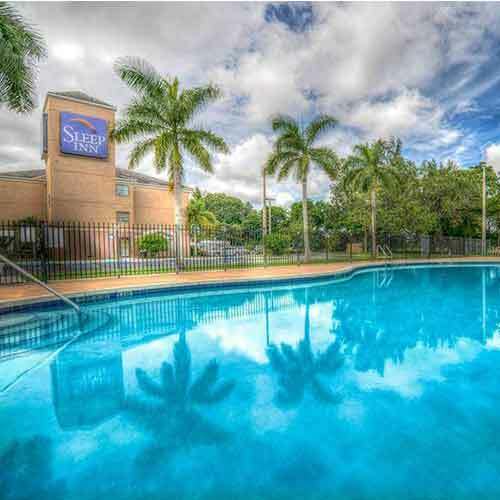 Near the airport and just a short drive from the Port of Miami, this small hotel offers guests modest accommodations at affordable rates. Guest rooms feature dark wood tones and granite counters. All guest units come equipped with a refrigerator and a coffeemaker for your morning jolt. If you're looking to relax and soak up some of the Florida sunshine, then head out to the pool area that faces the parking lot. Smoke free premises. 118 units. 3 stories, interior corridors. Bath: shower only. SR 826 exit NW 36th St (SR 948), 2.4 mi e to NW 54th Ave, just n to Fairway Dr, then just e. 105 Fairway Dr 33166.